Curated by Carly: Diane W Designs Giveaway! Missed my last giveaway? No need to fret - Another giveaway starts today! 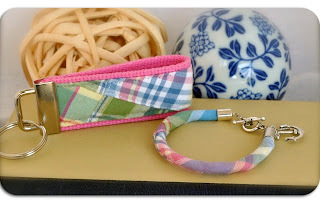 Enter this giveaway for a chance to win this adorably preppy madras anchor bracelet and matching key fob from Diane W Designs! Follow the instructions below and enter by July 15 at midnight. We'll announce the winner on the blog, Twitter, and Facebook on July 16. The print is adorable! It reminds me of home at the beach in Florida! Oh my gosh the madras is sooo cute! I would wear it everyday! I guess that mostly means I would wear it to class. I would wear it to work!! It would go so well with so many of the scrubs I own!